I recently came across this post on the blog of the Orthodox Christian Network. Thanks to the author I have her permission to reproduce it here. Over the next few days I will be posting the five reasons to visit a monastery. There are in no particular order but are here for your edification. Any questions on any of these please feel free to contact us. Thus, the goal should be to find a spiritual guide who not only preaches Christ, but lives like Christ. As Monk Isaiah wrote to Nun Theodora: “The Holy Spirit is for everyone; but in those who are pure of the passions, who are chaste and live in stillness and silence, He reveals special powers.” (Monk Isaiah to Honourable Nun Theodora, Matericon, 160). This is the primary reason why a person living in the world seeks spiritual direction from those living in monasteries. 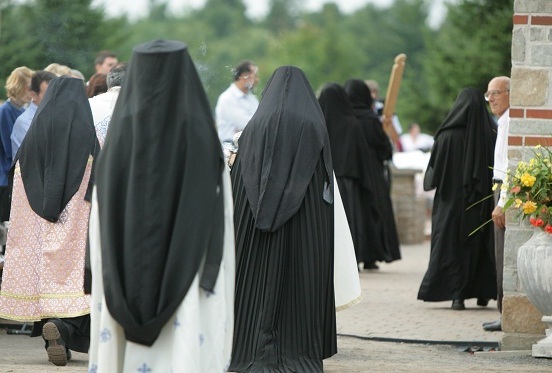 Not because the Holy Spirit only dwells in those who wear the monastic habit, but because their way of life is far more conducive to acquiring the Holy Spirit. The greatest spiritual guides are those whose manner of life teaches as much or more than their words and advice. If a spiritual guide does not live the commandments of Christ, if he has not experienced temptation, if he does not actively struggle to overcome his passions, then how will he teach others to do likewise? On this point Archmandrite Zacharias of Essex says: “if the word that the spiritual father says is not seasoned with grace, nor proceeds from a heart that is warmed by the love of Christ, it becomes like the work of psychologists or counsellors – a ‘half-blind’ worldly activity. 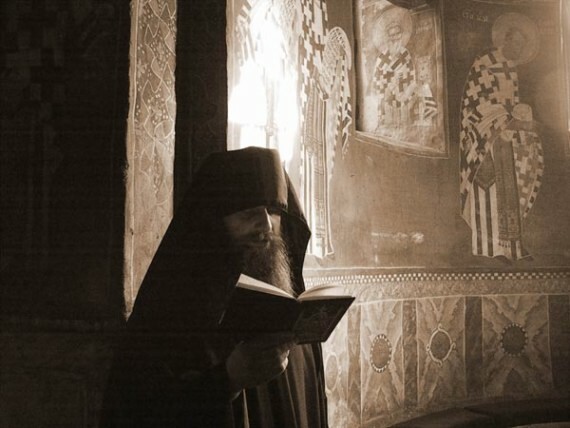 The word of the spiritual father must bear the seal of grace, the seasoning of grace.” (Archimandrite Zacharias, The Enlargement of the Heart, 174). Perhaps the greatest contribution of the monastic way in our contemporary world is its prophetic presence in an age of confusion or ignorance, when people tend to overlook the spiritual dimension of the world. “A little yeast leavens the whole batch of dough” (Gal. 5:9). By purifying their own souls, monastics seek to purify the soul of every person as well as the soul of the world. The prayer of monastics sustains the whole world (Gen 18:23-33). Their primarily spiritual importance, therefore, becomes social, moral, and even environmental. In the fourth century, Evagrius of Pontus defined the monk as “the one who is separated from all and at the same time united to all.” He was right. By restoring the divine image within their own bodies and souls, monastics aspire to refresh the divine image within all people and to renew the face of God on the face of the whole world. Thus, a genuine monastery is “an icon of the church,” says the great visionary Saint Basil (330-379). Indeed, a genuine monastery might be said to constitute an icon of the entire world. It is an example and prototype of a healthy community. Within this context, a genuine monastic does not evade social responsibility; he or she seeks a deeper response to the meaning of life, in the re-creation and reformation, the transfiguration and transformation of the entire fallen world, by silently changing water into wine through Christ (cf. John 2:1-11). Monasticism proposes a different way of perceiving and doing things in the world. In our age, we have become accustomed to seeing things in a particular way. Indeed, we are constantly bombarded by numerous images, both visual and aural, that determine our ways of responding and reacting. Monasticism provides us with a different set of values, an alternative way of living without compromising. Monasticism seeks to change the world with silence and humility, rather than through power and imposition. It changes the world from within, internally, and not from the outside, externally. In many ways, authentic monasticism proposes a revolutionary worldview, especially in a world where so many people are stuck in established ways that have proved destructive. The silence of the monks is a way of waiting on the grace of God, an earnest expectation of the kingdom. By maintaining the spirit of the Gospel, monasticism is said to constitute the sinews of the Church (St. Theodore the Studite, 759-826) and the lungs of the entire world. When it functions properly – and, like any other human institution, it does not always function smoothly – monasticism transmits clean are that sustains all people, all animals, and all creation. 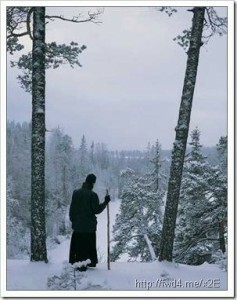 In many ways, then, the silent prayer of monastics bears greater influence and impact on the natural environment than numerous visible and loud actions that catch our attention. Saints cleanse their surroundings by spilling into them the grace of God that permeates and fulfills everything. It is no wonder that so many Orthodox saints had a natural and friendly relationship with animals that lived near them. The practice of the fourth step of humility, according to Saint Benedict, is very demanding and painful. It is only in light of the mystery of the cross of Christ and of his supreme obedience to the Father that we can begin to apprehend the hardship entailed in this form of following the Lord. If we think that physical suffering is difficult to endure, we shall soon find out that mental and emotional suffering is many times more painful. Only those who have endured unjust persecution and the mental anguish that sort of suffering carries with it have experiential knowledge of how painful it is to assent to God’s will under such circumstances. We shall not be surprised, if in a moment of weakness and fear, we try to escape from the practice of this step. Jesus Himself prayed: “Father, if it is possible, let this cup pass me by.” it is precisely at this moment, though, “with a quiet heart” as counseled by Saint Benedict, that we try to submit to God’s wishes as we utter the remainder of Jesus words: “Nevertheless, let it be as you, not I, would have it.” In this submission, all natural resentment emanating from the source of this suffering begins to lessen, and a deep inner peace – a sure sign of the healing presence of God – settles in. The mystery of monastic obedience, and its only justification, is based on Jesus’ submission to his heavenly Father. Throughout his thirty-three years on earth, he not only obeyed his heavenly Father but also his mother Mary and his stepfather Joseph. This submission to his Father was carried out to the end of his life, as he obediently accepted even death, death on a cross! Following the example of Christ, the monk promises to remain obedient “even unto death” in the monastery. The monastic obedience implies fidelity and daily submission to the will of God, to the Church which is Christ’s Body, to the Rule, to the monastic tradition, to the Father of the community, and to one another. Obedience allows the monk to become a servant as Christ became for our sake. Obedience, for the monk, is expressed ultimately in the humble respect he shows towards the abbot, the brethren, and all those he comes in contact with, seeing Christ in all of them. The essence of the Christian life consists in the imitation of the life of Christ. He is the model. He is also the master and we are the disciples to whom he utters the invitation: “If anyone wishes to follow me, let him renounce himself, take up his cross and then follow me.” In order to follow Jesus, we must embrace the cross, the small crosses of everyday life, and follow the path of self-renunciation. This path is not easy, for we know it to be so contrary to human nature. Jesus never promised us that the way to heaven would be easy. What he promised was to send us a Comforter who would remind us of Jesus’ teachings and, at the same time, give us the strength and the necessary fortitude to follow the ways of the Gospel, no matter how perilous they may seem to be. By St. Nikolai Velimirovich That God may forgive us, let us forgive men. We are all on this earth as temporary guests. Without forgiveness and true mercy. God is the true Physician; sins are leprosy. Whomever God cleanses, God also glorifies. Every merciful act of men, God rewards with mercy. He who returns sin with sin perishes without mercy. And light disperses the darkness of the dungeon. As if seeing a torch dispersing the darkness, everyone rejoices in mercy. But when he is overcome by misery, he cries out for mercy! And that mercy of God wakens us to life! Today the Church begins the season of Great Lent. For the past few weeks we have been preparing for this time of the year and now it is upon us. What are you going to do during this season to make it different than any other time of the year? Here are some suggestions of things that you can do to make this Great Lent special. This time of year makes it easy to be a bit more prayerful. The services of the Church lend themselves to the spirit of prayerfulness more this time of year than any other. There are several opportunities for your consideration. The Presanctified Liturgy – As in years past we will alternate this Wednesday evening service with our friends at St. Nicholas Albanian Orthodox Church. Starting at 6:30 pm the service is a kin to Vespers with the addition of the reception of Holy Communion from the Presanctified gifts. In my estimation this is one of the most beautiful liturgies of the Orthodox Church and is the oldest known liturgy. Daily Prayer – Each day at 6:30 am in the Monastery Chapel the Midnight Service will be prayed and at 8:00 am the Canonical hours will be prayed. Each evening at 5:15 pm Vespers will be served. These services help us to focus throughout the day on our prayer life. If you are able try to attend as many services as possible. During the period of Great Lent the Church reads from the Book of Genesis, the Prophet Isaiah, and the Book of Proverbs. Genesis reminds us of the creation of the world and the perfect state that we humans were created to live in. The Book of Proverbs is the moral code that the Church built her life around and the Prophet Isaiah informs us of the coming of the Christ that we will welcome on Pascha. The daily email will contain the readings for the day and if you do not have access to email they will be include in the weekly bulletin. Take the few minutes each day to read the Scriptures that the Church has appointed for these days. Reading Scripture should be a part of everyday but it is essential during Lent. The Church directs that these days we abstain from all meat and dairy products and we also fast. Fasting means that we do not over eat and we remain hungry. We spend more time talking about food during Great Lent than anything. Fasting and Abstinence is an important spiritual discipline that needs to be a part of our everyday spiritual life but it is a very large part of our Lenten journey. However we should not be so concerned with the letter of the law that we miss the spirit of the law. Strict fasting, no meat products which includes fish, no dairy products, which include eggs, no oil, or wine during this period of time. With that said one needs to start slowly and move towards a more stricter fast. If you presently keep the Wednesday and Friday fast during the year, add another day of the week. If you do not keep the regular fast then start with Wednesday and Friday. Start with a goal that you will be able to meet. The strict fast is the goal that one day we can aim for but if you have never done this before it is not easy and should be entered into slowly. If there are medical reasons for not fasting or abstaining then speak with your physician prior to starting any program. I am always available to answer questions. One way to truly live the spirit of Great Lent is through almsgiving. 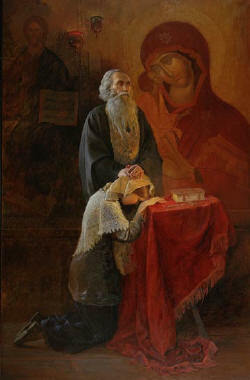 The Orthodox Church has a long standing tradition of Philanthropy and almsgiving is part of it. Through the support of the poor and the needy we live of the Gospel command to love your neighbor. Here are a few suggestions: Bring a non-perishable item to church. Starting this week a box will be placed in the entrance of the Church for you to place these items in. These items will be placed on the table in the hall for use during our community meal. Volunteering at the Community Meal. If you have spare time you can practice almsgiving by giving of your time on the 1st, 3rd, and 4th Thursday of the Month at the Community Meal. We gather in the hall around 3:00 pm to set up the hall and serve until 6:30 pm. The clean-up is done and we are gone by 7:30 pm. Come for all or part of it. Almsgiving also includes money. If you fast from a meal take the money you would save and give it to the poor and needy. All of these are examples of almsgiving and should be a part of our Lenten journey. Confession needs to be a part of our Lenten Journey. Confession is vital to the life of an Orthodox Christian. If it has been some time since you have been to confession make this the year you return. Don’t wait until the last minute; confession will be available after Vespers on Saturday night as well as after all of the Service of Holy Week up to Holy Friday. Make every effort to make a good confession during this time of the year. It is important for us to remember that we need to focus on the spirit of Great Lent and not just the legality of Great Lent. We can get lost in the details of what we are eating and what we are not supposed to eat and that defeats the entire purpose. As I have mentioned before, if you finish Lent the same way you started it did not work. Focus on the spirituality of Great Lent this year and all of the other things will work themselves out. As part of our Lenten prayers we should try to pray the Prayer of St. Ephraim once a day. Take a few moments each day to say this short prayer. Please know that I will continue to pray for all of your during this Holy season of the Church. How does one live the monastic life in this crazy world that we live in? What are the aspects of the monastic life that even lay people can use in their everyday life to enhance their walk with the Lord? The monastic life is like a three legged stool based on Sacred Reading, Manual Work, and Liturgical Prayer. Each of these legs is important in the life of the monk and without one the stool will not stand. Each of these legs needs to be worked on and worked at if they are going to keep the life of the monk balanced. Sacred Reading is not a new practice but is as old as the Church. For generations monks have made this a part of their daily practice. It is also, I believe, one of the lest understood legs of the monastic stool. It can be said that once you are schooled in a particular spirituality then you remain in that spirituality for the rest of your days. I was schooled in the Benedictine Monastic tradition and this influences my spirituality today. I am also school in the Celtic Spirituality and this influences my spiritual life as well. Both spiritualities practiced some form of sacred reading. In the monasteries of St. Benedict he allotted two to three hours a day during the summer months and up to five hours during the winter months. So Scared Reading was important to St. Benedict and his monasteries. 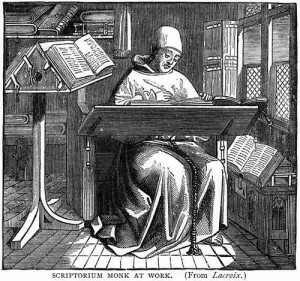 St. Benedict believed that idleness was the enemy to the soul and so he prescribed reading and manual labor to his monks. Sacred Reading is the process of assimilating the word of God by letting its very meaning spread through your blood to all parts of your body. To become one with the Word so you can become one with the Word. What is the process of Sacred Reading? 1. Time ~ There needs to be a set time, not only a length of time but a time of the day. It has been suggested that you start with no less than a half hour per sitting. The time of the day is up to you but it should be a time that works and will have the least amount of distractions. If that is even possible in out busy daily lives. 2. Place ~ The place you choose is as important as the time you choose. It needs to be a comfortable place, not too cold not too hot, and free of distractions. No radio or other sound. You need to feel at home in this place and relaxed. 3. Be at Peace ~ The Word of God will speak to us if we are in a state of relaxed peacefulness and we are also willing to accept the Word that will be spoken We need a sense of quiet receptivity to the Word. 4. Prayer ~ As with anything, this will be a grace guided activity so one needs to pray before starting. Pray that God truly speaks to you through His Word. Use your own words or if you like the words spoken prior to the reading of the Gospel during the Divine Liturgy: Enkindle in our hearts the pure light of your divine knowledge, O master, lover of mankind, and open the eyes of our mind to the understanding of your evangelical proclamations. Instill in us so that, trampling down all bodily desires, we may practice a spiritual life, thinking and doing all which pleases you. What Scripture passage to start with? The easiest answer to this question is to use the Scripture the Church selects for each day of the week. These can be found in many places but one of the most comprehensive lists on the website of the Greek Orthodox Archdiocese. If you wish, although I do not suggest this to start with, you can just let the Bible fall open to any Scripture passage you wish. Let us now look at each of these. Reading ~ Begin with a careful attentive survey of the passage. Grasp the central idea that the author is trying to convey. Listen to what the text is saying, what is being said and not being said. Ask what the meaning of the situation or the text is. Where is it taking place and who is it addressed too? Meditation ~ Turn the passage over in your mind. Chew on it, ask questions about it. Again note what is said and not said and ask why. If you get stuck on a particular word or phrase stick with it and find out what it is saying to you. Probe the passage for the underlying meaning and hear the words as if they were written just for you. Prayer ~ Shift from the text you are reading to God. Move from the word, the Divine Speaker of the Word, to the Word, God. Dialogue with God about what you have just read and ask questions of how this may or may not apply to your life. ~ Rest in the presence of God. Let the words wash over you and be at peace with them and with God. Just bask in the Divine Light of the Lord and the Word. Remain with God and listen with the ear of your heart not the ear of your mind. Meet the Lord in the mystery of the silence you now sit in, the silence created without and the silence created within. This is not an easy process or procedure to follow and it will seem difficult at first. It will be dry and it will take some time to get used too. You will feel like your wasting your time, but what a better way to waste time then wasting time with God and His Word? Monks have been practicing Sacred Reading for years and it takes that long to get into it. Just start and let God work in your life. Once you get into it you will notice a difference in your life. The Word of God is living and it needs to live in each one of us. It will be fruitful and multiply if you let it.